If you had to think of just one racing game - the chances are high that it would be Out Run. From its origins in the 80s this arcade classic has undergone several re-inventions, re-inventing the graphics, the cabinet but keeping the same underlying great gameplay. Speaking of cabinets, these were always a stand-out part of the experience and something that continues to this very day. If you are looking for an Out Run cabinet Liberty Games can help - we can refurbish you an existing cabinet or you can enjoy the game on one of our many multi-game machines. Never has racing been so glamorous as in Outrun. Just think about it, you are a sunglasses-wearing badass in a sweet convertible traversing some paradise highway, with a blonde bombshell in the passenger seat, driving so fast that you cannot even see the speed limit on the signs. This is Outrun, the Sega developed racing game from the mind of iconic designer Yu Suzuki released in 1986 to serious fanfare. While speed is a very important aspect of the game, Suzuki classified OutRun as a “driving” game as opposed to a 'racing' one, and emphasized the themes of luxury and relaxation....which made sense since you play as a dude cruising with his girlfriend in a tops-dropped Ferrari. Part of this inspiration came from Suzuki’s love for the 1981 film, Cannonball Run. With OutRun being in a genre of its own, let’s just call this game a 'Road-Trip-em-up'. 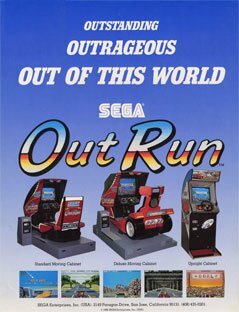 OutRun also served as a precursor to future games that put an emphasis on player choice, which up to that point, was almost non-existent. Not only did you have the democratic ability to choose your route in the game, OutRun doubled down by offering three different songs with which to choose: The high-energy Splash Wave, the super-chill Passing Breeze, or the awesomely literal Magic Sound Shower. The branching routes also came with their own endings, five to be exact, gave determined players a nice little present upon finishing the race which went beyond the standard "Good Game" followed by ending credits. Considering the ultra-lux setting and the games' elitist aesthetic, it also seems natural to observe that you are not actually racing against anyone. It's just you, your driving companion, your car and a time limit. If you hit checkpoints in time, the limit will be extended in order to continue on. Your thrill-ride will only end if you are unable to hit the next line before time runs out. The theme of of grandiose excess the game brings is met in equal amounts with technological firepower. OutRun impressed arcade-goers with the help of raster graphics on a color CRT monitor and amplified stereophonic sound. The same scaling technology used in Space Harrier was brought to OutRun to created a feeling of speed and movement that was unmatched at the time. Even with the impressive visuals, the technical limitations of the time did give developers some trouble, leading to exclusion of such features as turning the car around or reversing, and in doing so, destroying the hopes of anyone who immediately regretted their route choice. This ability to "Cruise 'n Choose" (I am trademarking this term immediately), coupled with the style, look and feel of the game, all aided OutRun in becoming the highest selling arcade game of 1986. The racing community and the seatbelt lobby will forever be in your debt, Yu Suzuki!